The first feature length film from director Rodrigo Cortes, “Buried” tells the story of Paul Conroy (Ryan Reynolds), a contractor in the Iraq war zone. After his convoy is attacked and most everyone is killed, Conroy now finds himself buried alive: a plain pine box somewhere beneath the countless miles of desert. It takes almost no time at all for the movie to establish its enclosed environment. Cortes does an incredible job of not just showing me where Conroy is trapped but making me feel where he is. It’s no small feat given that, by the very nature of the story, he’s limited in his choice of camera angles. Speaking of limited, the premise of being buried alive is usually married to a serial killer of some sort or, at a more personal level, associated with a descent into madness. In this case, screenwriter Chris Sparling (“An Uzi At The Alamo”) takes this element and places it in a fresh and topical environment. He does a very good job, but not perfect – more on that later. Ryan Reynolds is the singular star of this film. There are no flashbacks to set things up or cutting away to search parties – nothing – just Reynolds in a box with a lighter and a cell phone. A staggering amount of faith in his acting is displayed here and rightfully so. He knocks it right out of the park. There wasn’t a single moment of watching him where I didn’t feel his fear or anger radiating off him. He makes the movie worth watching all by his lonesome. However, he can only take the movie so far. As someone put it to me, “It’s 107 minutes of Ryan Reynolds in a box.”It’s 94 really, but the point is essentially the same. Quite simply, there is only so much you can do with a limited number of elements. You have Reynolds, a coffin and a cell phone. Since the entirety of the movie takes place here, there’s only so much you can do with it. I think that maybe as a one-hour network television show – about 44 minutes – it might have been perfect. At over an hour and a half, the story starts to get little tedious. It’s almost as if Sparling ran out of meaningful things to write about and just started throwing things against the wall to see what sticks. Some of it, sadly, was just downright irritating. Maybe it was nine years worth of training from the Marines coming back to visit but some of the things he does are just counter-intuitive to his survival. If I were in the situation, as scared and panicked as I would be, I will still do whatever I could to maximize my chance at survival. Conroy does not and, great of a job that Reynolds does with him, that took me right out the movie. 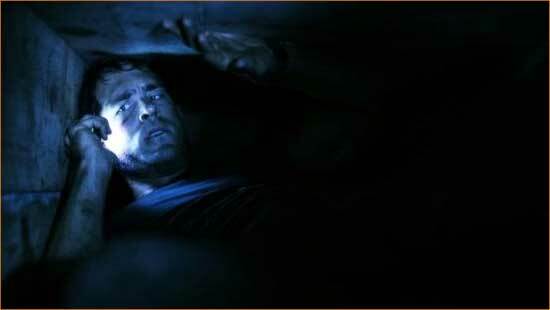 “Buried” is a wonderful showpiece for Ryan Reynolds, but as a whole, isn’t as great as his performance.